A 42-year-old female patient was admitted to our outpatient clinics with hypertension. She presented with long-standing essential hypertension that was resistant to pharmacological therapy with five different antihypertensive drugs, namely irbesartan 300 mg/day, Triazide 25 mg/day, amlodipine 10 mg/day, spironolactone 100 mg/day and nebivolol 5 mg/day. Her office blood pressure was 175/100 mmHg. All causes of secondary hypertension were excluded. She did not have diabetes mellitus, coronary artery disease or renal failure. Transthoracic echocardiography showed normal left ventricular systolic function and mild mitral regurgitation. Fundoscopy revealed grade 2 hypertensive retinopathy. Due to the uncontrolled nature of the resistant hypertension and progression of target organ damage, the patient was eligible for percutaneous renal denervation treatment. Under local anesthesia, the femoral artery was accessed in standard technique, 5000 IU UF heparin was given intravenously and fluoroscopic angiography was performed to visualize the renal artery. 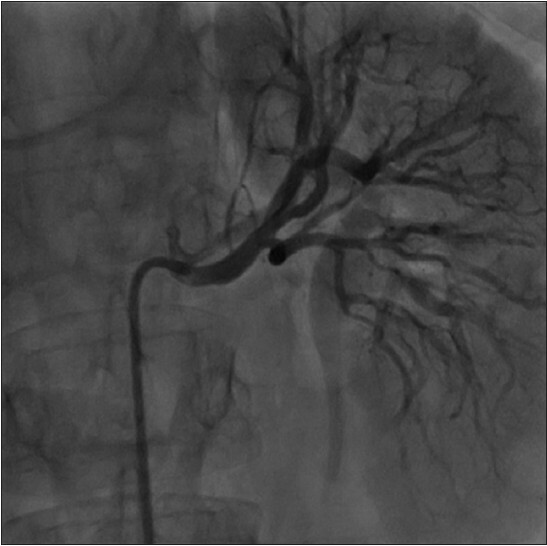 Angiography showed normal configuration of the right renal artery (diameter >4 mm, length >20 mm, no stenosis; [Figure 1]). 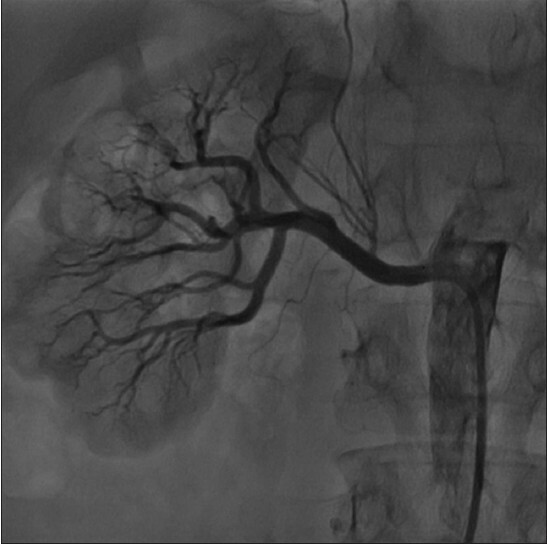 While there was a well developed accessory renal artery on the left side [Figure 2]. The diameter of both left renal artery and left accessory renal artery were greater than 4 mm and their length was greater than 20 mm [Figure 3]. To prevent renal artery spasm IV nitrate was injected directly to renal artery. Midazolam was used for sedation. Then the specially designed and commercially available radiofrequency ablation catheter (Symplicity, Ardian, Medtronic) was inserted into both renal arteries, and accessory left renal artery. Denervation was performed with application of 6 low-power radiofrequency treatments along the proximal portion of the vessels. Mean temperature was 50°C during 2 min of ablation at each point. Radiofrequency ablation was applied to both renal arteries and accessory left renal arteries without apparent procedural complications. There were no vascular complications. After the procedure, the patient was followed in the coronary care unit for one day. Immediately after the procedure, the patient's blood pressure was reduced to 110/60 mmHg. No change was observed in renal functions of the patient. The patient was discharged at the third day with nebivolol 5 mg/day and amlodipine 10 mg/day. Her blood pressure was 120/80 mmHg at office and ambulatory blood pressure monitoring was repeated which revealed an average systolic and diastolic blood pressure of 119/63 mmHg one month later. The patient was prescribed only amlodipine 10 mg/day. Resistant hypertension is defined as uncontrolled blood pressure despite the use of optimal doses of three antihypertensive agents, of which one is a diuretic. The sympathetic innervation of the kidney is implicated in the pathogenesis of hypertension and resistant hypertension through effects on renin secretion, increased plasma renin activity that leads to sodium and water retention, and reduction of renal blood flow. Percutaneous catheter based renal denervation has been shown to reduce blood pressure and the sequel of hypertension via interference with both efferent and afferent sympathetic nerves function and potentially further central mechanisms. ,,] Symplicity HTN 1 is the pilot feasibility trial carried out in patients with resistant hypertension evaluating the efficacy of renal denervation on blood pressure compared to a group treated with medical products. A significant blood pressure reduction at one month follow-up of 14 and 10 mm Hg (systolic and diastolic, respectively) was followed by a sustained response with a pronounced systolic and diastolic blood pressure reduction of 27 and 17 mmHg, respectively, at 12 months. In Symplicity HTN-2 (Renal Sympathetic Denervation in Patients with Treatment-Resistant Hypertension) trial, 106 patients with resistant hypertension were randomized to catheter-based therapy in addition to conventional antihypertensive medications versus antihypertensive medications only. In the renal denervation group of 52 patients, office blood pressure drop was evident as early as one month post-procedure and a statistically significant decrease of 32/12 mmHg was present at six months, whereas in the control group no changes in blood pressure were observed. In both of the trial mentioned above, patients with accessory renal arteries were excluded. The reason for exclusion of such patients might be due to potential risk of complications during the procedure as suitable arteries are considered to be with diameter <4 mm. 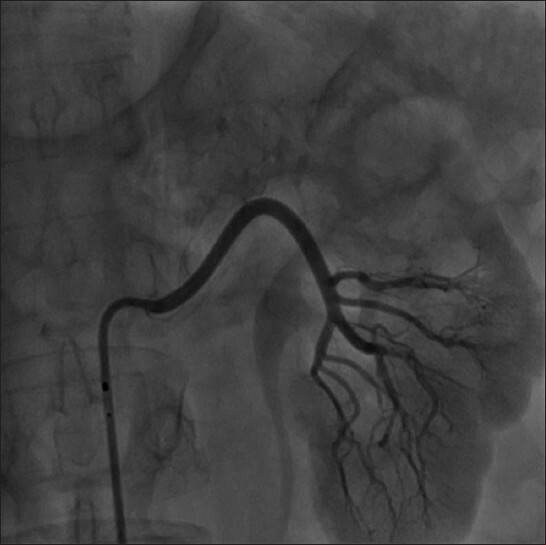 In our case, the patient had a well developed left renal accessory artery. We believed that if we omitted the well developed accessory renal artery, we would not have maintained adequate blood pressure control. Thus, we also applied radiofrequency ablation to that artery. The immediate decrease in blood pressure suggested that application of the procedure to the accessory artery was beneficial. The significant decrease in blood pressure continued one month after the procedure. In all of the studies of renal artery denervation, patients with accessory renal arteries are excluded. Thus, it cannot be assumed that renal denervation in the main renal arteries will translate into a similar beneficial effect in patients who have accessory renal arteries. We presented a young female patient with resistant hypertension who successfully underwent percutaneous renal denervation of the both renal arteries together with left accessory renal artery. 1. Calhoun DA, Jones D, Textor S, Goff DC, Murphy TP, Toto RD, et al. Resistant hypertension: Diagnosis, evaluation, and treatment a scientific statement from the American Heart Association Professional Education Committee of the Council for High Blood Pressure Research. Circulation 2008;117:510-26. 2. Krum H, Schlaich M, Whitbourn R, Sobotka PA, Sadowski J, Bartus K, et al. Catheter-based renal sympathetic denervation for resistant hypertension: A multicentre safety and proof-of-principle cohort study. Lancet 2009;373:1275-81. 3. Symplicity HTN-2 Investigators, Esler MD, Krum H, Sobotka PA, Schlaich MP, Schmieder RE, et al. Renal sympathetic denervation in patients with treatment-resistant hypertension (The Symplicity HTN-2 Trial): A randomised controlled trial. Lancet 2010;376:1903-9. 4. Tsioufis C, Kordalis A, Flessas D, Anastasopoulos I, Tsiachris D, Papademetriou V, et al. Pathophysiology of resistant hypertension: The role of sympathetic nervous system. Int J Hypertens 2011;2011:642416. 5. Doumas M, Faselis C, Papademetriou V. Renal sympathetic denervation and systemic hypertension. Am J Cardiol 2010;105:570-6. 6. Schlaich MP, Sobotka PA, Krum H, Lambert E, Esler MD. Renal sympathetic-nerve ablation for uncontrolled hypertension. N Engl J Med 2009;361:932-4. 7. Esler M, Lambert G, Jennings G. Regional norepinephrine turnover in human hypertension. Clin Exp Hypertens A 1989;11(Suppl 1):75-8.